NASA astronaut Kjell Lindgren makes his way towards the Alpha Magnetic Spectrometer on the outside of the International Space Station near the beginning of his spacewalk with mission lead Scott Kelly on Oct. 28. NASA astronauts Scott Kelly and Kjell Lindgren successfully completed their first-ever spacewalks today (Oct. 28), completing a handful of tasks vital to the International Space Station's longterm endurance. NASA's 32nd International Space Station (ISS) spacewalk officially started at 8:03 a.m. 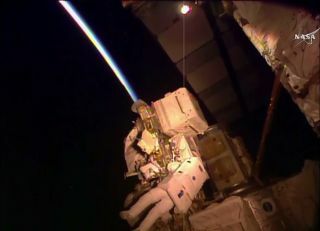 ET (1203 GMT) and lasted for 7 hours and 16 minutes as Kelly and Lindgren performed a handful of important maintenance tasks, including putting additional shielding over a science experiment, lubricating the station's robotic arm and rerouting cables to a future docking site for commercial spacecraft. Veteran spacewalker Tracy Caldwell Dyson — who spent more than 188 cumulative days in space, and a total of more than 22 hours outside the space station over the course of three spacewalks — walked the pair step-by-step through their mission tasks from NASA's Mission Control Center in Houston. "You guys probably noticed that the sun came up, huh?" Caldwell Dyson said early on in the mission. "Well, don't forget those visors, if you haven't used them already — they'll come in handy when that big fireball is staring at you." The duo's exit from the space station was delayed when Lindgren turned on the water to his suit a bit too soon, before the airlock had been fully decompressed. But, after careful observation to make sure there were no ill effects, the astronauts moved forward. Once outside the space station, the astronauts split up to perform their initial tasks separately. Kelly removed insulation from a failed main bus switching unit, which controls the power sent from solar panels to the station, so it can be robotically removed later. Lindgren added a thermal wedge and a protective blanket to the Alpha Magnetic Spectrometer (AMS) on the station's exterior, to shield the instrument from the sun and harsh space environment, and thus extend its life span. NASA astronaut Kjell Lindgren opens the cover of the Alpha Magnetic Spectrometer in order to photograph it before putting on a cooling wedge and protective blanket during his first spacewalk on Oct. 28. The AMS, an experiment to search for dark matter, has been aboard the space station since 2011, in which time it has recorded more than 60 billion cosmic rays passing through. It was launched on the final flight of the space shuttle Endeavour, which was commanded by Kelly's twin brother, Mark. After removing and stowing the insulation, Kelly carefully made his way toward the station's main robotic arm, Canadarm2. NASA ground control moved the arm to within his reach so he could lubricate many of the joints at the end, which grabs ahold of cargo and visiting spacecraft. (NASA astronaut Terry Virts lubricated other joints in February.) Japanese astronaut Kimiya Yui helped Kelly throughout the hours-long task by maneuvering the arm from inside the space station. The day-lit Earth stretches beneath astronaut Kjell Lindgren Oct. 28 as he makes his way over to reroute cables on the outside of the space station's Harmony module. Now, the duo has some time to relax before preparing for their second spacewalk next week — a complicated one on which they'll be reconfiguring a station cooling system and topping off its supply of ammonia. Nov. 2 is the 15th anniversary of continuous human presence aboard the ISS, NASA officials wrote on the space station blog — and during 189 total spacewalks, astronauts have ventured out to do the tasks necessary to keep the orbiting habitat running. Scott Kelly is embarked on his third space mission, while Lindgren is a spaceflight rookie.